When the law has a job they can't handle... they need a man outside the law. 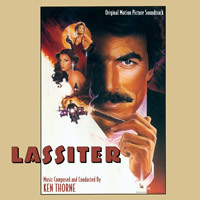 BUYSOUNDTRAX Records presents LASSITER, featuring music composed and conducted by Ken Thorne for the 1984 action film written by David Taylor, directed by Roger Young and starring Tom Selleck, Lauren Hutton, Jane Seymour, Bob Hoskins, Ed Lauter and Joe Regalbuto. Tom Selleck plays Nick Lassiter, a handsome jewel thief operating in London in the late 1930’s, as the second World War approaches. Arrested while breaking into a mansion, Lassiter is blackmailed by Scotland Yard. The offer: Break into the German embassy and steal 10 million dollars in Nazi diamonds before they can be used to finance Hitler’s military buildup. Refuse and he’s off to prison. To provide music for LASSITER, the producers hired veteran composer Ken Thorne. As the film is a period piece, Thorne wrote a score drawn from elements of 1930s jazz music and also adapted popular tunes of the period to be used in the fabric of the score. A small orchestra made up of trumpet, clarinet, alto sax, trombone, tuba, banjo, drums, and piano would be used to perform the period elements of the score. Strings, French horns and extra percussion would augment the orchestra for some of the action scenes. Ken Thorne was born in England in 1924. During the 1940’s, he had a successful career as a big band pianist and later decided to take music studies seriously, studying composition at Cambridge. His film work began in earnest in the early 1960’s, scoring comedies and crime dramas. In 1965, Thorne reunited with director Richard Lester on an early film starring the Beatles, HELP! For this assignment, Thorne was asked to adapt the popular songs of the band and incorporate them into the underscore of the film. HELP! was a great success for everyone involved, including Thorne and he became Richard Lester’s composer of choice for many years, collaborating on films such as HOW I WON THE WAR, A FUNNY THING HAPPENED ON THE WAY TO THE FORUM, JUGGERNAUT, ROYAL FLASH and SUPERMAN II & III. For his work on A FUNNY THING HAPPENED ON THE WAY TO THE FORUM, he received an Academy Award. In addition to collaborating with Richard Lester on his films, Ken Thorne has also scored feature films such as INSPECTOR CLOUSEAU, HANNIE CAULDER, THE MAGIC CHRISTIAN, ASSAULT ON AGATHON, THE PROTECTOR, THE EVIL THAT MEN DO and THE HOUSE WHERE EVIL DWELLS. For television, Thorne has written music for series such as THE PERSUADERS and television films such as THE HUNCHBACK OF NOTRE DAME, THE RETURN OF SHERLOCK HOLMES, GREAT EXPECTATIONS, RETURN TO LONESOME DOVE and LOVE COMES SOFTLY. Originally issued on LP at the time of the film’s release, BUYSOUNDTRAX Records presents the first appearance of LASSITER on compact disc. This release contains all of the music from the original album and features music that is previously unreleased. This is a limited edition release of 1000 units. The first 100 copies will be autographed by composer Ken Thorne.